We were greatly blessed by the generosity of God’s people during our Outreach last year. 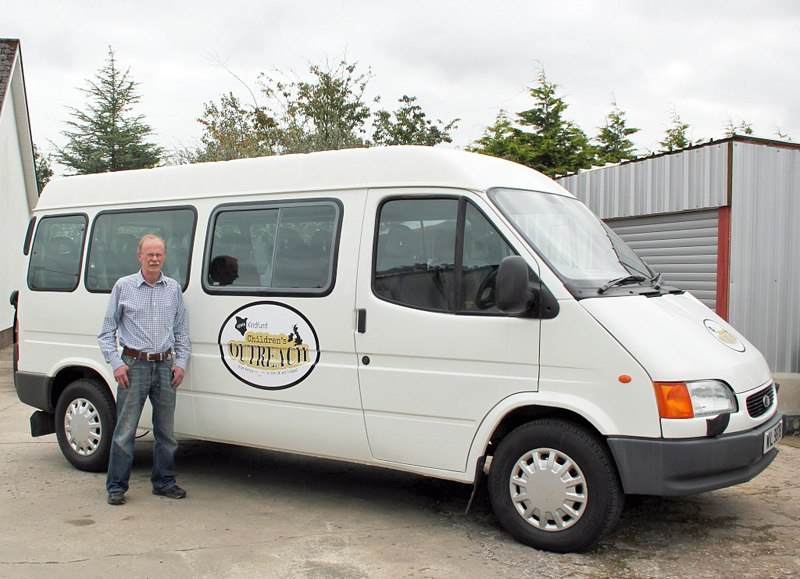 In preparation for the Kindfund Outreach last year, we purchased a 14-seater minibus for £600. This decision led to a series of miracles when, first, a businessman replaced the £600, then a business-lady offered to insure the vehicle; another businessman then agreed to fuel it and finally Dessie Moore from Omagh agreed to rehabilitate it, put it through MOT and tax it! 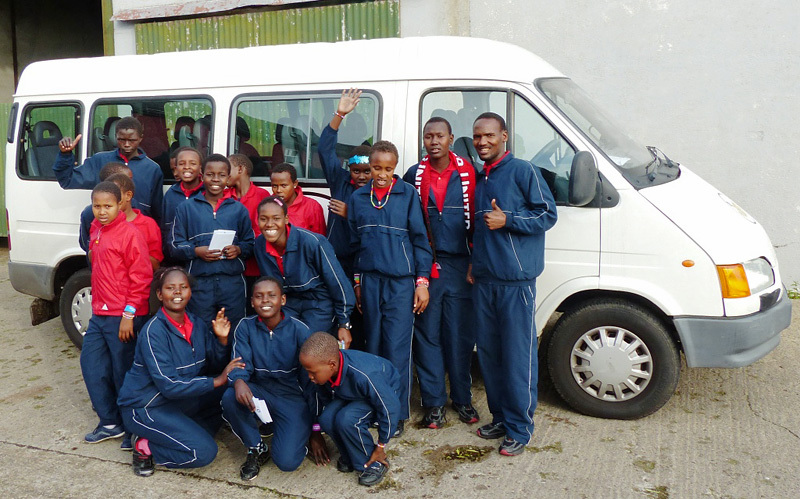 With the vehicle restored like new, the Kenyan children were taken all around the Province over four weeks (sometimes accompanied by a second minibus kindly provided with driver and fuel by Fermanagh Christian Fellowship Church, Enniskillen). The crowning glory came when Dessi was able to sell the minibus for £3,200 and all the proceeds came to Kindfund! Was amazing to see how the Lord used your children to touch everyone’s hearts, the mime was powerful. The time spent was such a blessing! Ken - I don't know how to put today's experience in word. It was too good to explain in a sentence or two but we were blessed. Well and truly. I had a tearfest when the kids left, I didn't get anything taught the last period as our lot were incapable with the emotion! Thank you for bringing the children today to our school, Erne Integrated College. It was a privilege to spend time with them and to hear about their lives in Kenya. 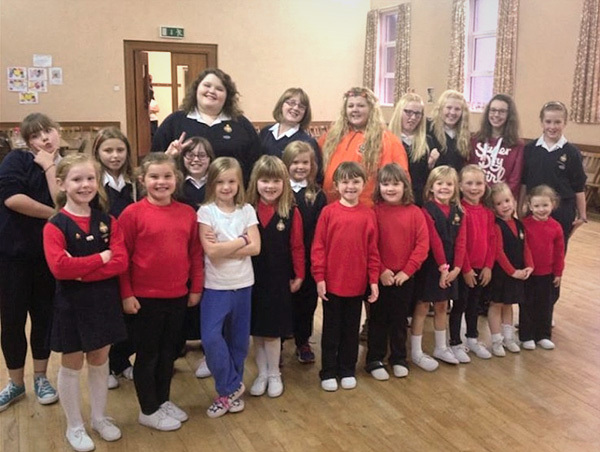 I hope to come to Florencecourt tomorrow night to hear some more of their wonderful singing. God bless you all. What an amazing day ice skating. What a wonderful morning we had at Abbey Presbyterian Monkstown when the children visited with us today. We were greatly blessed as they sang, the mime to one of the songs was very emotional. May God richly bless them with good health and safe journeys as they travel about worshiping Him. Hi Ken and Pamela, thank you for replying to me - I wanted to be able to send you some photos of your girls visit with us on Monday Night past at Boardmills. I do have more and will send in due course. Our girls had a very special and memorable time. Thank you again. Our girls were still buzzing last night, the kids must be shattered and excited to tell all at the same time! Glad everyone home safe. It has been a real blessing to have been able to share some of their time here in NI - I don't think our girls will forget their visit. Memories for all. God Bless, hope you get time to rest from your travels. Glad to see all made it home safe. I'm sure it's hard to believe it's all over after all the planning and hard work put in. Was amazing to see how The Lord used your children to touch everyone's hearts, the mime was powerful. The time spent was such a blessing! Was amazing to meet the strong support in enniskillen also, fantastic bunch. Thank you all. I Pray the children are settling back in to normal routine okay. Miss you guys already! God bless. We think and pray for all of you but especially our friends - Florence , Martha, Rose and Glory and Dominic who shared our home and made great friendships with us all We pray for God for thanks for your friendship and faith in our lives and pray that you keep up that singing and good fun which makes you such nice people Never forget how special you all were to us a disciples of Christ helping us on our pilgrimage and blessings to all who came and those who stayed at home to pray for them Have a great Christmas Day and we will all pray for you all have a smile at the memories and the friendship we have. Thanks ken. What a wonderful experience it was in October to be part of your amazing trip with such beautiful and special children. Just had one of the most memorable services in 19 years of Ministry. Thanks for coming to Trory. I was personally touched by the two lovely letters received from Florence and Jackline, writing on behalf of all the children that came to the UK. I was most impressed by their very good handwriting and perfect English. We were all privileged and honoured to be part of the Kindfund Tour. Hi Ester, Jacqueline, Scola and Chu Chu and everyone at Kindfund. I'm writing this today reflecting on the wonderful few days we spent together when the girls came and stayed with us. I hope everyone is well and working hard. It is so important to keep up the studying. Our weather here is now so cold and I think Scola especially would never be able to go out without a few scarves on. Paul, Caitlin and Ciaran and I will always be so grateful that we had the opportunity to have you stay with us and there is not a day that goes by that we don't think about you all. Keep faithful and trust in God. And remember that we will always be here for you. All our love and prayers always and merry Christmas. Six of our Senior girls enjoyed a treat with an overnight trip to Thompson’s Falls, a spot of shopping and lunch in a posh hotel! Following on from our visit to Northern Ireland with 24 children and two staff, we used some of the gifts the children brought back with them as we dressed six of our senior girls for a trip to Nyahururu and Thompson’s Falls (the girls were mainly excluded from the NI trip because it was their KCPE year and the exams were held at the beginning of November). We travelled in our 8-seater Toyota Regius which has been only recently rigged out in the Kindfund livery. Enroute we stopped at Nanyuki and then Nyeri. At the latter we visited the grave of Baden Powell, founder of the Scouting Movement, and enjoyed a treat of lunch in an upmarket hotel. The girls enjoyed Thompson’s Falls, including some of the side shows common at most tourist attractions. 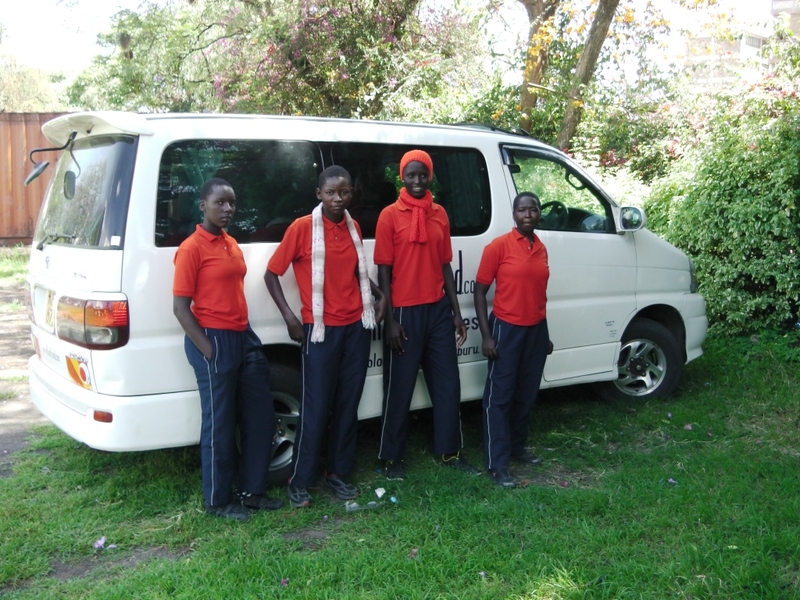 At Nanyuki, on the way back, the girls visited the market to spend their small amount of pocket money and greatly enjoyed the bargaining. We’re delighted to finally launch our programme for the Kindfund Children’s Outreach in Northern Ireland. Find out when they will be coming to a venue near you! Sun 5th Oct, 10.00 am, 11.30 am & 6.30 pm Bangor West Presbyterian Church. Youth, Early, Family, Cafe Church and Evening Services; Wed 8th Oct 7pm in the West Hall. The family, friends and dignitaries gathered at 10am on Saturday morning from Ngaremara, Archers Post, Isiolo, Meru, Wamba (and even Northern Ireland) to witness a full rehearsal of the children’s work. What a feast of lively singing and spiritual worship was served up to them! The children appeared in the attire specially designed for them for their visit to Northern Ireland and they took the hall by storm as they marched smartly in to the hymn ‘Marching in the light of God’. Later the tempo changed as we were treated to Kiswahili praise songs, solos and duets, while others gave testimonies and reminded us of verses from the Bible. The highlight of the first half came with a mime based on the Crucifixion followed by the beautiful voice of a 13-yr-old girl singing ‘How can you refuse Him now’? The children left the hall to complete reverential silence. The standard was maintained in the second half and people were deeply moved by the message and the skill with which the children presented it. The Headmaster of the primary school at Ntepes Wamba summed up everyone’s feelings by expressing his pride that these children will be representing Kenya in Northern Ireland. He had closed his business for most of Saturday just to be with us. Amongst the most faithful supporters of Kindfund over the years has been Lylehill Presbyterian Church in Templepatrick, Co. Antrim. 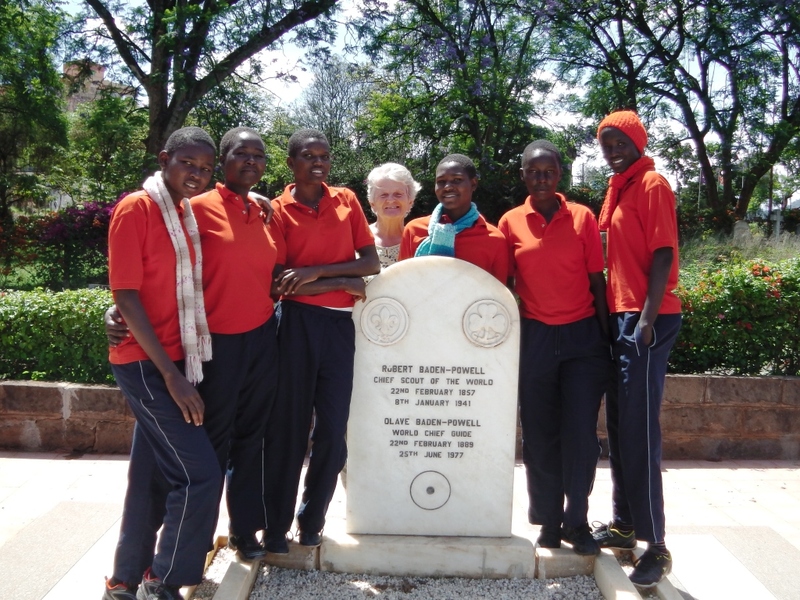 So when their Girls’ Brigade and Boys’ Brigade heard that Kindfund children were coming all the way from Kenya to Northern Ireland, they were really keen to make welcome presents to give them on arrival. After lots of discussion GB Leaders Heather, Lauren, Claire, Hazel and Louise, and BB Leaders Uel and Suzanne organised a project that children, parents and leaders could all get stuck into – putting together toiletry bags and pencil cases. The toilet bags each contain a face cloth, soap, shower gel, toothpaste, toothbrush and pack of tissues – just the thing to get refreshed after what will definitely be a long and very tiring journey. The pencil cases contain pencils, a rubber, sharpener and note book so the children may not get completely away from their normal schoolwork! 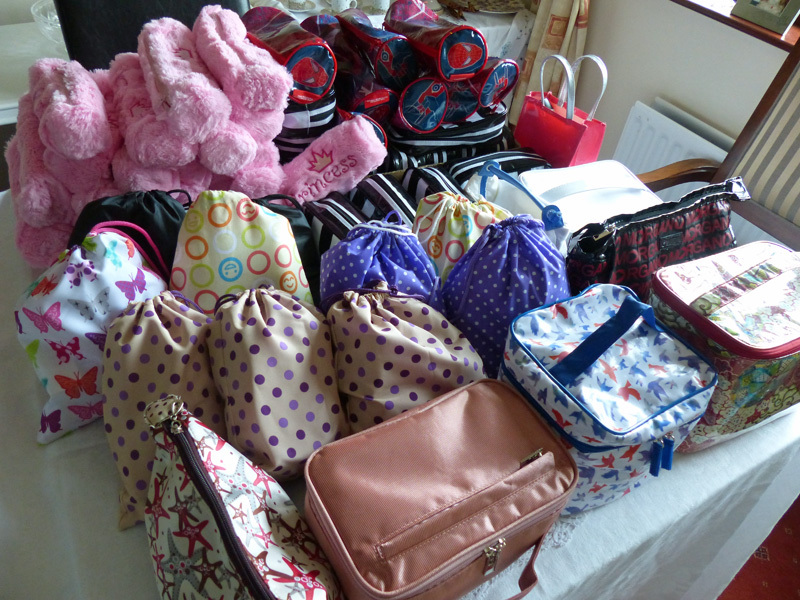 Each child will be given their own toiletry bag and pencil case when they arrive in Fermanagh next week, plus additional toilet bags and pencil cases will be sent out to Kenya with the children, when they return home at the end of their Outreach. Meanwhile, the GB look forward to meeting the children during their visit in October, and will be spending an evening with them at Lylehill. It took a team effort to conquer Mount Kenya – and we did it! With Andrew Black in the lead position on the computer, Martin on documents and Dominic bringing up the rear as guardian, the final peak of Mount Kenya succumbed to our well-organised team effort. Visa4UK could only hold out for four days before the flag was planted on the summit. The email arrived: “Collect your passports”! Here we all are – with our 26 Kenyan passports containing the British Visa stamp, ready to invade Northern Ireland later this month. We are excited, ready and thankful – thankful for all of you who have supported us throughout the campaign to climb Mount Kenya since the expedition set out 12 months ago. Some warned of failure, but we now rejoice that our God is able, and nothing or no-one can stand in the way of His plans. A rollercoaster ride lasting three-and-a-half months…but we achieve our objective! 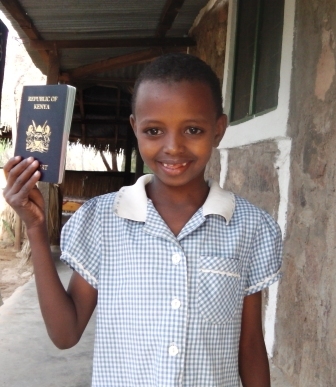 Wednesday 23rd July proved a memorable day when Dominic phoned through from Nairobi to tell us he had Glory’s passport – the final one we needed. From start to finish it has been a dramatic – traumatic – time for our small administrative team dedicated to seeing the passport process through to a successful conclusion. Thanks to Dominic, Martin and Andrew for commitment and patience as we overcame setback after setback. So far, young Glory has managed three visits to Nairobi, with another one still to come; great experience for a seven-year-old! We are now on the home straight with fares booked and deposits due on 15th August. This week we visit the visa office in the capital on Wednesday morning for interviews. So on Tuesday twenty-nine of us will invade Lazarus and Jane’s home for a second time. What fantastic friends they are to allow such an invasion of their privacy! 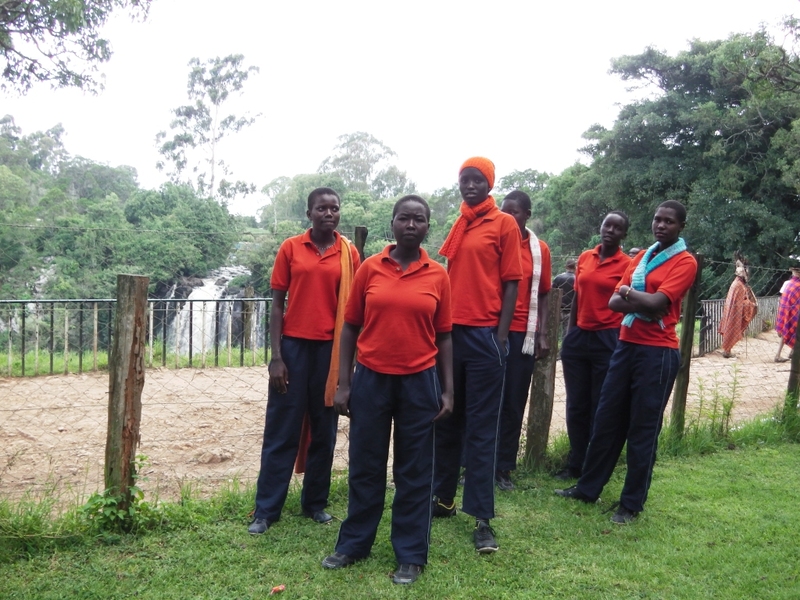 (Lazarus and Jane co-ordinate the distribution of BES Bible material across Kenya: please pray for them). Andrew Black has been a tower of strength in assembling all the documentation we will present and making the online applications. Please continue to pray us through this final stage of the Outreach preparation. The children continue to get ready and today the Wamba contingent arrived ahead of Tuesday’s trip to Nairobi. Since school has finished too, it’s a great chance for them all to practice together. Who can resist a Catchphrase Competition? That’s what Philip Lucas reckoned when he decided to create one as a fundraiser for Kindfund Outreach. The ‘say what you see’ style quiz challenged the participants to solve picture clues – and win a prize. The worthy winners – Yvonne Hutton (1st), Marion Farls (2nd) and Joan Allen (3rd) – were EXTRA worthy…because they very kindly donated their prize money back to Kindfund! Thank you to everyone who took part in the quiz. If you’re still scratching your head over some of the tougher pictures we’ve included the quiz – complete with answers – here. Watson Black and John Steen, two former colleagues of Ken Dobbin from his Bank of Ireland days, were determined to do their best to raise funds for the Kindfund children coming to Northern Ireland in September. 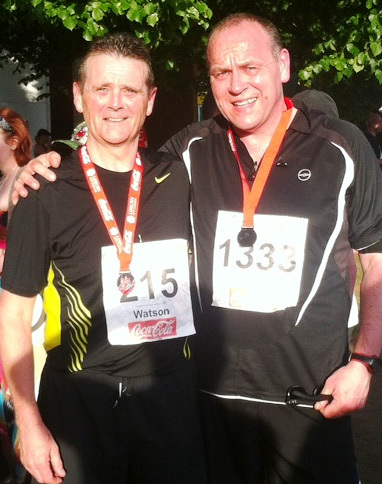 The goal was to complete the Lisburn 10K, held this year on 18 June, and their strict training regime paid off when they successfully finished the run…as shown by the big smiles on their faces (or are those grimaces?!). They say their time was a little faster than they had hoped for, though they’re not yet ready to take on the Kenyans! Please take this opportunity to encourage them by making a small donation on their Give.net pages (Watson and John) and perhaps they’ll do it all over again in 2015! It was an amazing two days at the home of two of our supporters with their wonderful Fragrances of Kenya flower festival. 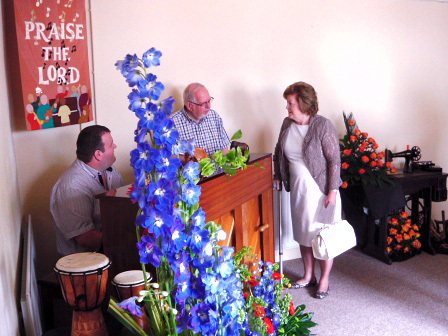 Organised by Glenn and Adele Moore to celebrate the 10th Anniversary of the work of Kindfund among orphans and poor in Northern Kenya, the festival of flowers and music held in Manoo, Kesh attracted visitors from all over Fermanagh, Donegal, Cavan, Monaghan and further afield from Claudy, Co. Londonderry, Greyabbey Co. Down and from Antrim, Armagh, and Tyrone. God’s grace was evident in many ways, perhaps best demonstrated by unusually favourable weather throughout the two days – ending with a sudden curtain of rain falling…an hour after the event closed on Sunday evening. We give thanks and glory to God for the inspiration and vision of Glenn and Adele who developed the idea over many months—inspiring others to use their creative gifts—and hosting the event. We are thankful too, for the untiring work of the volunteers who helped and for the response and generosity of heart of the people who attended and enjoyed the fellowship. What a great God we serve! 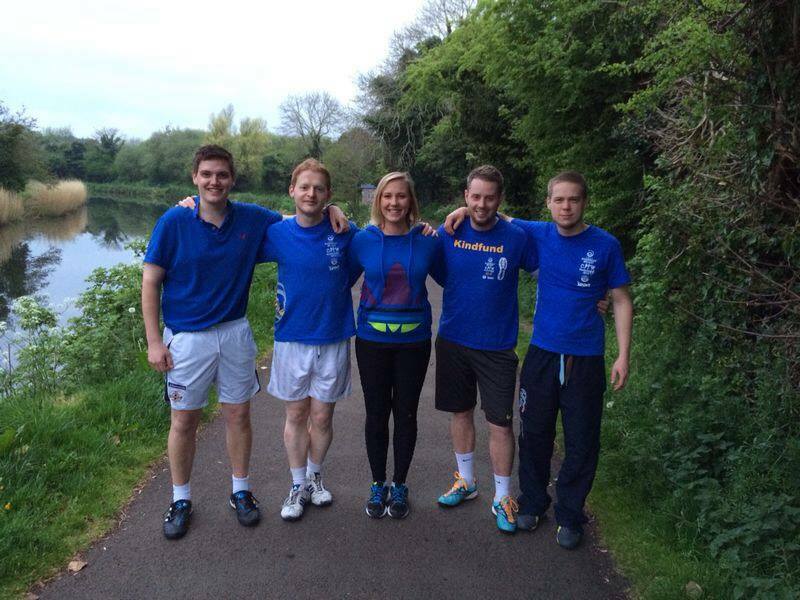 Alastair persuaded some friends to run the Belfast Marathon with him as a Kindfund funding event. Alastair Beacom, who visited Kindfund Kenya in 2012 and again in 2013, is looking forward to meeting some of the children he befriended in Kenya when they come for four weeks to Northern Ireland, in September. Thank you to those who took part and to to all who supported them! If you are planning a Kindfund fundraiser of your own (remember to get your fundraising pack) please send us your story and we’ll publish it here. Having negotiated the foothills, we returned to Kenya at the beginning of February to set up Base Camp and begin the ascent. But our first setback came soon – it was like an avalanche which would have swept us off the mountain straight away, but God is good and we were able to hold on and find a way through. Basically, we needed ‘approval to travel’ from the Ministry of Education, but we were approaching our goal from the wrong direction. Soon, though, we were on the right path and within a short space of time the vital letter arrived; we had conquered the first of four peaks. A few days later we reached our second peak, when approval was received from the Department of Child Affairs. At the beginning of April peak number three loomed into view. 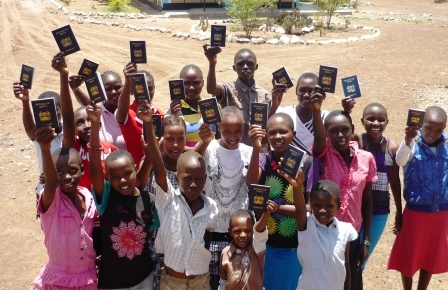 The goal was to get passports for 24 children, and involved 29 of us taking a hired bus run to Nairobi, which was a treat. Passports proved problematic, but with the help of the Court conferring legal guardianship on Kindfund, we managed to get 23 sorted out. Thanks to Lazaras and his wife from BES who hosted us all with overnight accommodation in Nairobi. Of course, nothing is straightforward, as we discovered four weeks later when we returned to Nairobi to find the Passport Office computer had crashed and all our photographs had been lost! That meant everyone travelling to Nairobi once more at the start of May, to have their photo re-taken. This time, though, we were successful with child number 24 too! As we write this we are waiting for the passports to be made ready. In the midst of our ‘climb’, other preparations for the visit have been gathering pace, and the benefits of work and rehearsal are beginning to pay off! 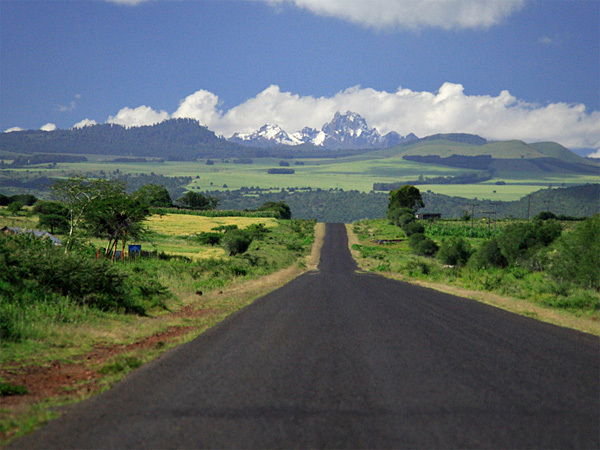 Please keep up the praying…we can see the final peak of Mount Kenya ahead – the applications for British visas. If you would like to help in any way, please contact us now. # Did Andrew finish his first ever marathon? Andrew Black’s Belfast Marathon took place on 5th May. We gave him a few days to catch his breath before getting him to report back! “I’ve always wanted to run a marathon, to conquer that 26 miles and 365 yards. At the end of January I decided I’d run the Belfast Marathon. I knew Kindfund where planning to bring some of the Kenyan kids over to the UK, so I decided to raise money for that. The training was hard going, every week I slowly built up the miles; eventually I hit the 20-mile mark and was ready for the big run. Marathon day – breakfasted on honeyed porridge; then plenty of fluids and I set off on my first marathon. With the help of a stereotypical iPod running playlist (including such classics as ‘Eye of the Tiger’), carbo gels, wonderful bystanders handing out sliced oranges and many, many prayers…I got to the finish line in 4:26:05. As can be seen from Andrew’s fundraising page at my.give.net/kindfundchildrensoutreach his sponsors helped him smash his £1000 target! Thanks to Andrew and all his supporters for this fantastic effort for Kindfund. 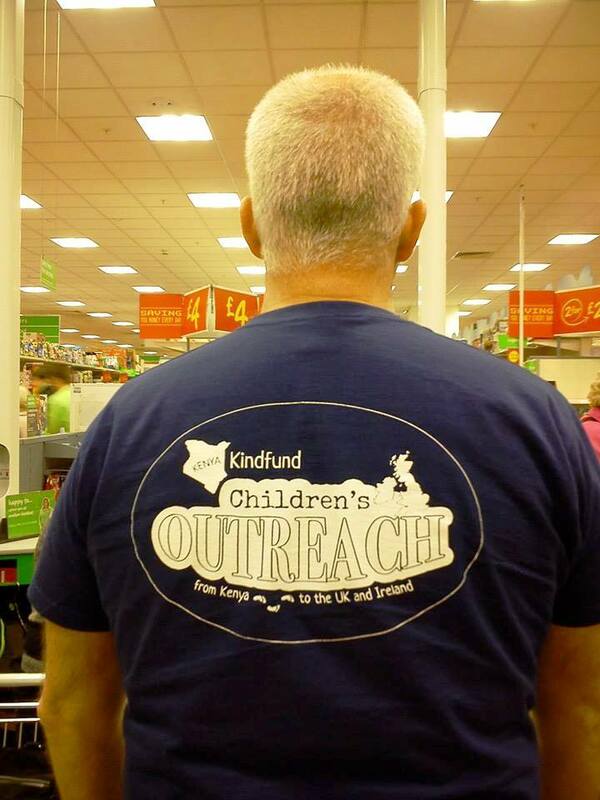 Thirteen Kindfund supporters gave up their time and energy at Asda, Bangor on Saturday 3rd May, in an effort to raise funds for the forthcoming Kindfund Outreach Tour due to visit the UK and Ireland in the Autumn. The volunteers took a shift at a time, many staying all day, to help pack customers’ goods. The shoppers repaid their efforts by donating a staggering £950 of their spare cash into buckets placed by Kindfund volunteers at the end of each aisle. Volunteers were overwhelmed with thankfulness at the opportunity the day gave them, not only to raise money for Kindfund, but to reach out to others the message of hope of the Gospel so practically demonstrated by the work of Kindfund. We had four requests for more information about the work of Kindfund and the interest and response shown by the people of Bangor and the staff at Asda was very encouraging. Thank you to all who have been faithful in prayer support. We finally have the approval we need! Yes, we have it in our hands! The much sought-after letter of approval for the children to travel to the UK—from the Ministry of Education, Science and Technology—was opened today and, as you can see from the extract, meets our needs. The journey to obtain the approval of Education and Child Affairs began last September and has been something of a roller coaster over the intervening months. In the end, the Ministry acted promptly once we understood their requirements; they delivered our letter on 4th April. Four days later we where told to collect the letter, which we arranged for someone to do for us and hold until Saturday 12th when Paul was going south to Nairobi on his return journey to the UK. The letter was collected and immediately sent back north to us with the matatu (taxi) Paul had travelled in. This letter—which contains the required approval for anyone of school age to travel outside Kenya—is a key document for us as we continue to plan and organise the Children’s Outreach. Thank you to all who have been faithful in prayer support as we have negotiated the bends on the road to obtain this approval. We have clearly seen God’s hand at several junctions on the way. A few weeks ago Andrew Black had the bright idea of collecting for the Kindfund Outreach during the upcoming Ulster v Scarlets game at the Ravenhill grounds in Belfast. So, on Friday 14 March—with the assistance of eight other rugby fans from Queen’s University Belfast—he did just that. At the final whistle Ulster’s 26-13 win over Scarlets was certainly convincing, but not quite as impressive as the size of the Kindfund win…raising a massive £677.56! Thanks to all the collectors for your brilliant effort! 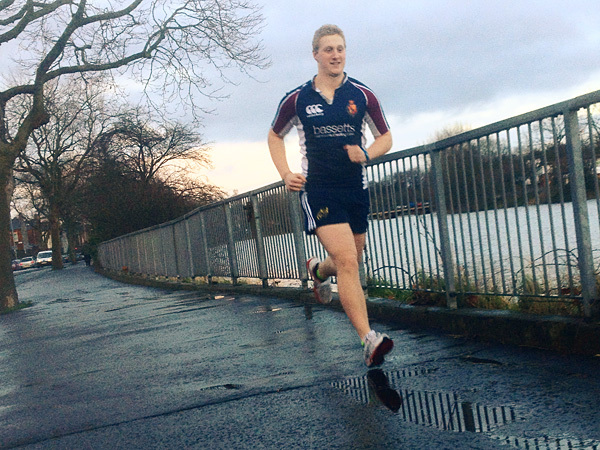 Read about Andrew’s Belfast Marathon preparations here. ‘Do not withhold good from those to whom it is due, when it is in your power to act’. We managed to fit in a lot of engagements with various government departments during our Nairobi visit, where we stayed at the revamped Anglican Guest House for a few days. I called in to the Department of Justice and renewed the Society registration – an annual requirement. Then we had an encouraging response from the Department of Child Affairs regarding our children’s visit to the UK and Ireland. I also went to the Department of Education with my letter for the Permanent Secretary. I believe I had God’s favour when I met the Senior Director of Quality Assurance – thank all of you who had prayed. We established a good rapport and he clarified the few additional things I need to provide them with before they can issue a letter of permission for the children to travel outside the country. Here’s more great fundraising news from our supporters in Co. Antrim, where almost £500 has been raised to help Kindfund. 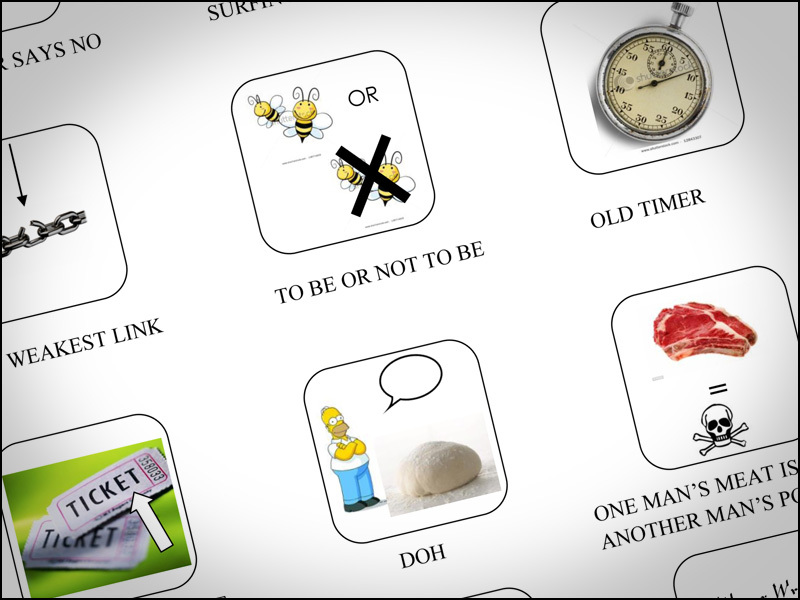 A catchphrase quiz (£1 per sheet) has been produced to raise money for the Children’s Outreach. To buy a catchphrase, or if you could sell some catchphrases in your local area, just email Philip Lucas . A tremendous total of £400 was raised to help the work of Kindfund, by the children of St Patrick’s Church of Ireland Sunday School late last year, when they had their annual Advent Appeal. And now the girls of Lylehill Presbyterian Church Girls’ Brigade are helping raise money for the Children’s Outreach by collecting 20p coins in Smarties tubes. So far they have raised £174. Well done girls! # Outreach fuelled by Ginger Cakes and Meringues? 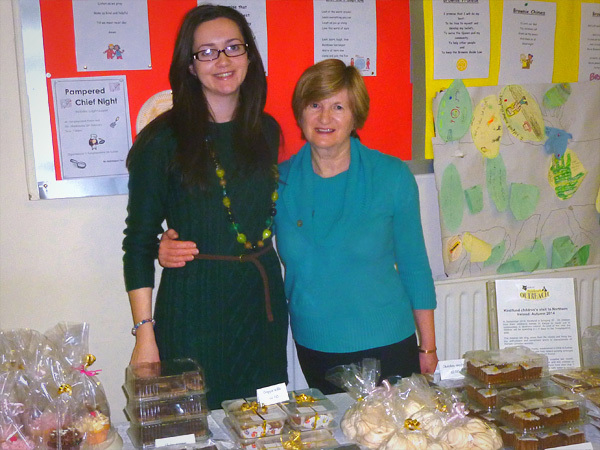 Caramel Squares, Holyrood Biscuits, Coffee Rolls and Cupcakes are all baked into a sweet fundraising idea. They are the key ingredients in traybake sales that Daphne Lucas and Catherine McCutcheon have started in Templepatrick, Co. Antrim. 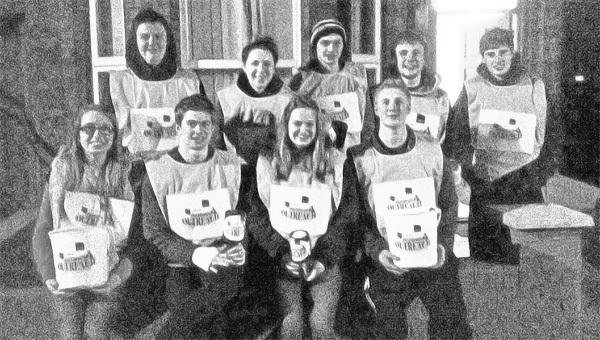 Their first sale was on 19 February and raised a huge £142, which has spurred them on to plan their next for 19 March. So, if you are in the Templepatrick area on Wednesday 19th from 12-2pm, drop in to the Soup Lunch going on in Templepatrick Parish Hall on the Old Coach Road, enjoy some tasty soup and buy some fresh traybakes to help support the Children’s Outreach. This week we were fortunate enough to get further press coverage of our Outreach event in the Impartial Reporter, another Fermanagh weekly newspaper. 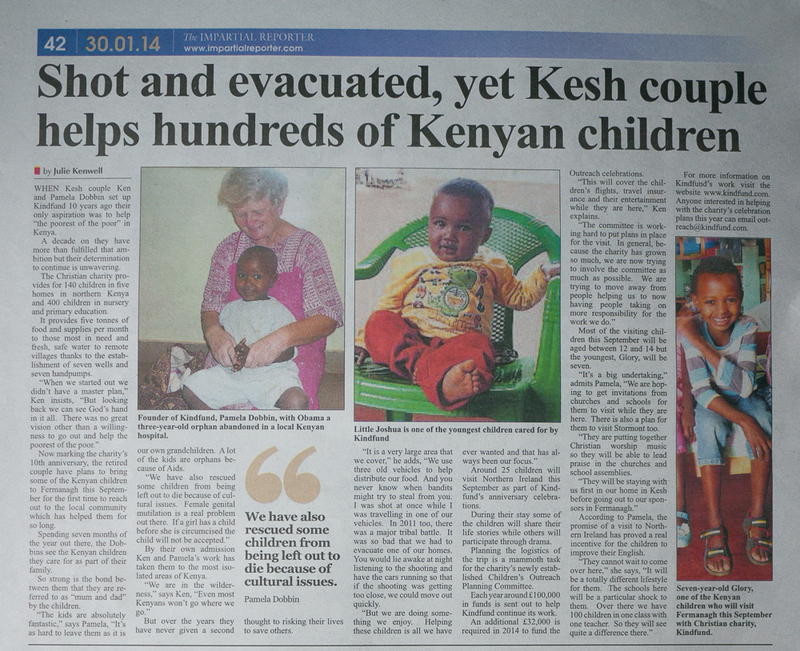 Enniskillen reporter Julie Kenwell took a great interest in our story, in Kindfund’s efforts among orphaned children in Northern Kenya and in the plans for this autumn. Read what she had to say. By the time our key people had had their say, the mountain seemed even higher. The task had become huge. The faint-hearted felt weak. You understand the difficulties, don’t you? There’ll be paperwork…visa and passport hurdles…and a huge culture shock…and there’ll be cost! You really want to bring twenty-five children from semi-desert Northern Kenya to a cold autumn in Ireland and Britain? This was the general reaction to the idea of bringing our Kindfund children on outreach to Ireland. We’d created our own Mount Kenya to climb and even before reaching the foothills, our key supporters started to raise the height of the summit! The faint-hearted felt weak. “Mum, is it true that I am going to Northern Ireland?”, said Glory (our first Kindfund baby – now a sweet 7-year-old girl) in perfect English. Pamela and I thought about those kids of ours in Kindfund Kenya who already were working flat-out to prepare for a great new adventure. So it was time to swing into action…and form a committee of the right people. In fact, form two committees, one in Northern Ireland and another in Kenya; inaugural meetings were held in November and December. January has arrived and we have, at last, got well into the foothills. The second meeting of the NI Outreach Committee has gone well and the wheels are beginning to turn. It’s a slow start to fundraising, but it’s encouraging nonetheless, though we need a lot more. Having often flown in and out of Nairobi we thought we had budgeted for airfares accurately. But prices are coming in 50% higher than expected. This means that price will dictate our route into the UK and this will inevitably determine which of our support bases in the South of England, Scotland and Northern Ireland we will be able to reach. Watch this space as we wait on further word from the airlines. It’s 21 January and in the past week our first promotional article has hit the press. 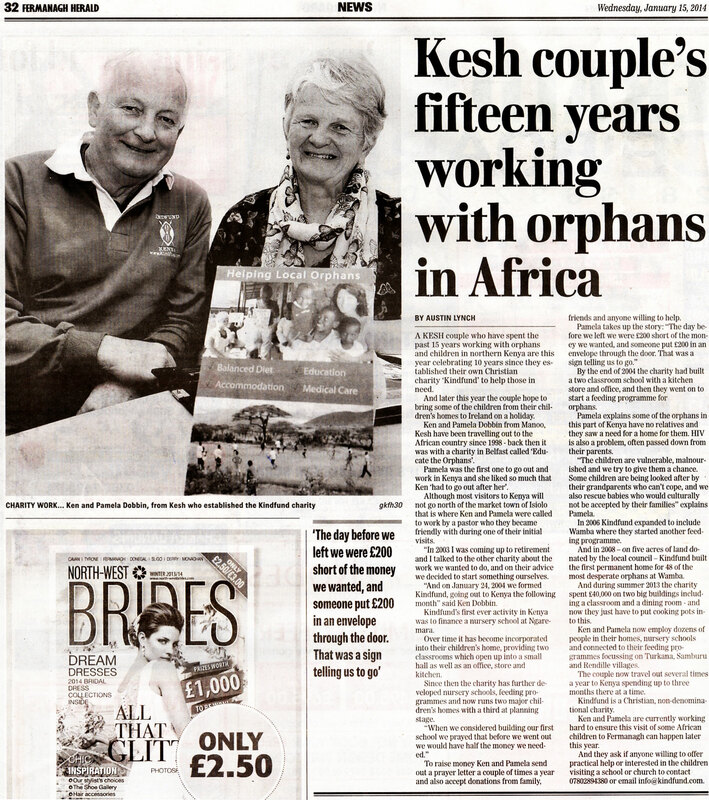 The Fermanagh Herald carry the story of Kindfund’s 10th Anniversary and our 2014 Outreach. 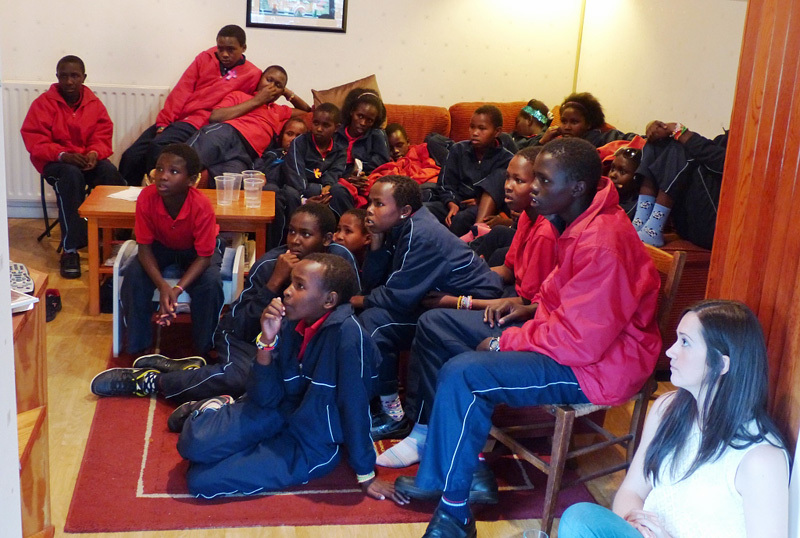 A local Fermanagh school immediately makes contact to see if their pupils can share in the experience with the Kenyan visitors! Promised letters of invitation for the children begin to trickle in from archbishops, and political figures too – MPs and MLAs. Their enthusiasm is tangible – and such an encouragement! At almost 17,000 ft Mount Kenya remains a challenge. Like thick vegetation, the bureaucracy in the foothills seems at times impenetrable, and we often almost despair. Yet the pristine snow-covered summit beckons us on. We gaze at the beautiful sight: children together, bubbling with excitement as they share, learn and worship; sponsors and supporters given the chance to meet and appreciate one another. Join us in this expedition. Rally round and we can scale this mountain together. Pray, climb and help us plant a flag on top – celebrating the achievements of our Kindfund children. Congratulations to Andrew Black from Co. Armagh – our first volunteer running in the Belfast Marathon on 5th May to raise funds for the Kindfund Children’s Outreach to the UK and Ireland. He has started his strict training regime today! We have 25 children coming in September and they will be a real blessing to all who meet them. Andrew has recognised this and has set out to ensure they come. 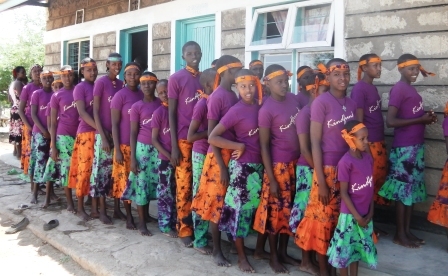 Kindfund—as part of their 10th anniversary celebrations—are raising £32,000 to fund the visit, which will be a life-changing event for children from the pastoralist semi-desert area of Northern Kenya. The children have already started to benefit from the project: since the summer of 2013 they have been practicing their English as they talk together, and they have been learning to speak out clearly in public. 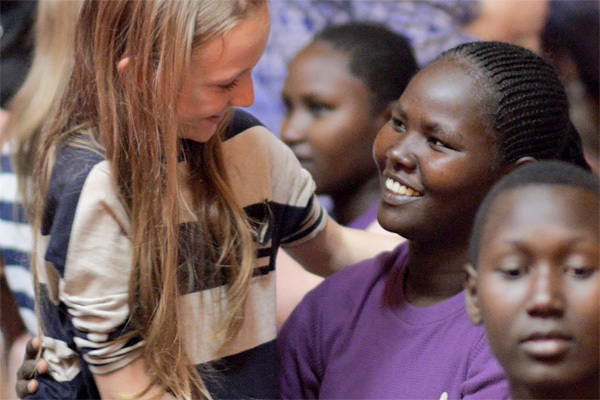 Pamela has just come back from Kenya after 4 weeks working with them to improve their singing and speaking (she returns at the beginning of February for another 3 months). She reports that the excitement is mounting and the ambition to succeed is palpable. Their English is improving rapidly, (exceedingly important for their educational success in Kenya, where all teaching is in English after Standard 3) and it puts us to shame when we consider that it is their third language, together with Swahili plus their native tongue of Turkana or Samburu. Andrew has opened a fundraising page at my.give.net/kindfundchildrensoutreach. If you would like to encourage him with a donation and be part of something good for the 25 children, please visit his page. In Autumn 2014 Kindfund will celebrate 10 years of work and witness in Northern Kenya! As part of that celebration we are bringing between 20 and 25 children from our children’s homes to reach out to communities in the UK and Ireland. Some will share their life stories, others will participate through drama. And the children will bring the joy, enthusiasm and movement which is characteristic of Kenyan Christian worship. 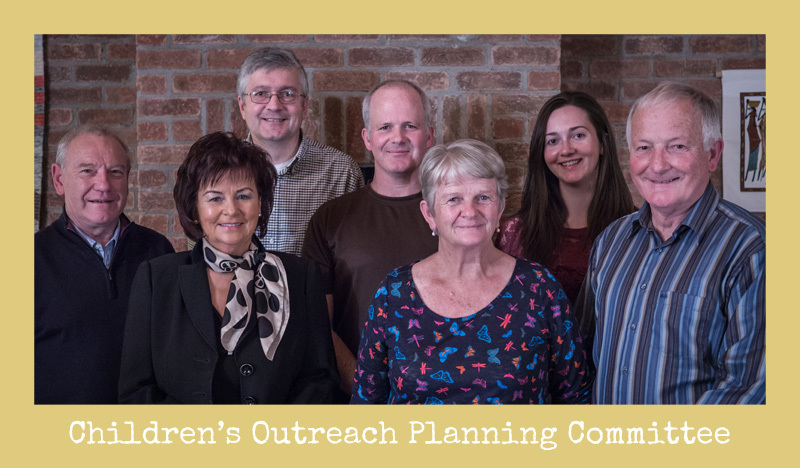 An inaugural meeting of the Children’s Outreach Planning Committee took place at Manoo in Kesh, County Fermanagh on Thursday 7th November 2013. The Committee has been specifically appointed to manage the visit to ensure that existing Kindfund resources are not impacted. If you have a heart to help in any way (for example, identifying a venue or providing resources) please get in touch. Kindfund was established as a charity in 2004 to further the gospel of Jesus Christ and to help relieve poverty amongst some of the poorest tribes in northern Kenya, working with the pastoralist Turkana, Samburu and Rendille. We currently use 5 tonnes of food and supplies per month, providing for 125 children in 4 homes and 250 children in nursery and primary education. We have dug 7 wells and fitted 7 handpumps, bringing safe water to remote villages. 100% of gifts go to Kenya.